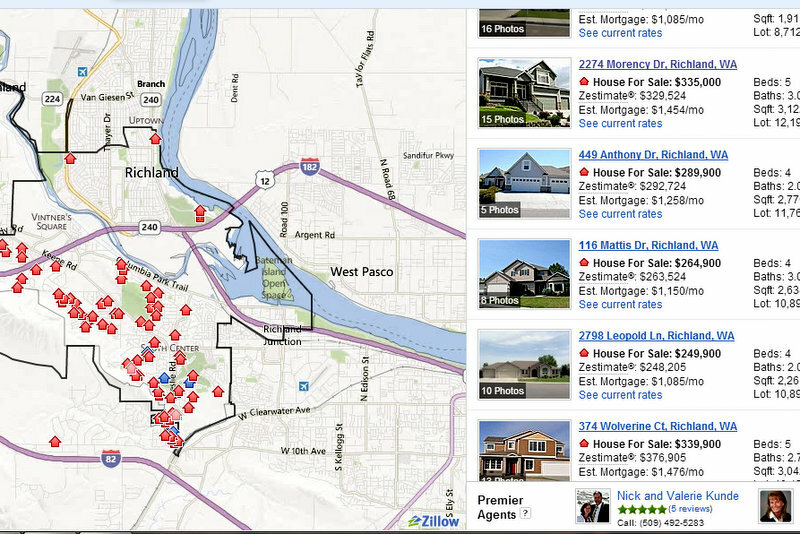 Zillow.com is one of the top websites that buyers in the Tri-Cities use for home searches, and we’ve teamed up with Zillow for advertising to give our listings more online visibility. As featured agents, all our listings become featured properties–they pop up when a customer uses Zillow to find homes with similar criteria or a nearby location. Three of our listings appear as suggestions in this South Richland search for 4 bdrm homes. If you click on an address, you’ll find more information. Photos, description, price history, tax assessed value, maps including an aerial view of the neighborhood, nearby schools, a “Zestimate” (an estimated value, which is not the actual or appraised market value), and an estimated monthly payment. If a customer has a question or wants more info about your house, they can call or email us, and we make arrangements to show your home. In the past year, we’ve noticed an increase in buyers who use Zillow to see what’s available, so we’re excited to be working with the site to help market and sell each home we have listed. Please give us a call at (509)845-4570 if you have questions about how we advertise your home online when you list with us.